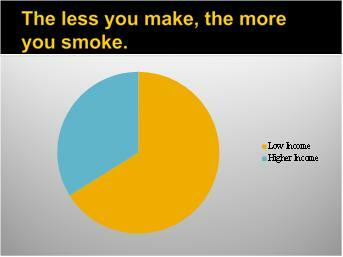 Being poor, also referred to as low income or low socioeconomic status (low SES), is the single greatest predictor that someone will become a tobacco user. This is true across the nation, as well as in Colorado. There are many factors behind this, including the fact that low SES communities are less likely to have members with access to and/or who participate in cessation programs or receive cessation advice which adequately meet the needs of this population. Not enough has been done to implement support resources for smoking cessation and prevention strategies that effectively target low SES populations and many tobacco education materials and programs are not culturally or linguistically appropriate for low SES populations. Also, individuals from low SES populations often live in communities where tobacco advertising and financial support for tobacco are prominent. These communities are more likely to be influenced by tobacco industry marketing and more likely to purchase tobacco products. 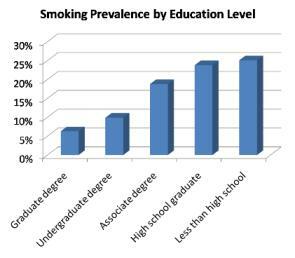 According to the Centers for Disease Control and Prevention, across the nation smoking prevalence increases with decreasing education.